Creeping Chill has been sanctioned for a month now, and Dredge is steadily regaining its former status as format boogeyman. David’s article from last week met the deck’s rise with an optimism I’m no longer sure I can personally espouse: despite the hate, Dredge put three copies into the Top 32 of GP Atlanta and, more recently, twice that many copies in the Top 32 of the latest Modern Challenge. So, is Dredge really back to stay? And how can Modern players beat it? This article examines Dredge’s known effects on Modern and whether they hold true without Golgari Grave-Troll in the picture. We’ll also weigh the respective merits of some of the top tools available to fight Dredge. Dredge is not known for being fun to have around. Although games against it are often interesting, the larger game of deciding whether to dedicate enough sideboard slots to defeat it or ignore it completely and hope not to play against it is one that is not very satisfying for most tournament players. We chose to ban the most explosive graveyard card rather than leave that subgame present. Whether Dredge is safe from the banlist depends on whether things are different this time around. Does the deck still force a battle of sideboards? Based on the lists I’ve seen online, I’m leaning towards yes: players are packing more graveyard hate than we’ve seen in years, and heavier graveyard hate to boot. Nihil Spellbomb, when it’s not chilling in the mainboard of some BGx deck, has taken a backseat to blazing-fast blowout answers like Ravenous Trap, a card that’s slumbered since the Troll ban. For its part, Dredge has adapted slightly to circumvent the hate. 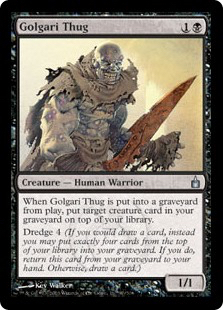 The major innovation we’ve seen in the last week has been its re-adoption of Golgari Thug, an additional heavy dredger. This inclusion makes the deck more resilient to targeting hate like Surgical Extraction, which can otherwise neuter its dredging abilities. With that being said, Dredge is proactive and consistent enough that it doesn’t need much tweaking to maintain its shares. Even with the level of hate present, it’s putting up results. Unlike other aggro-combo decks in Modern, traditional means of disruption—removal; targeted discard; countermagic—do little to contain the strategy. That’s why Affinity never ate a ban for forcing a “battle of sideboards;” BGx doesn’t need to aggressively mull into Ancient Grudge to stand a chance. The fact remains that Dredge eats just about every deck alive if that deck doesn’t either a) draw its sideboard cards in a two-turn window or b) race it, something that’s become quite challenging for fair decks thanks to Crippling Chill. At least one thing has changed since Troll’s reign over Modern: the second point no longer applies. The reason for this is that the decks that are faster than Dredge also rely on the graveyard. Storm, Ironworks, Hollow One, Infect, anything with Arclight Phoenix or Bedlam Reveler; these decks are putting up numbers through the hate, just like Dredge. How come? Hollow Phoenix replaces the delve threats and Flamewake Phoenix of traditional Hollow One with a more Hollow One-esque card, Arclight Phoenix, to have a functional eight copies of its namesake creature. Sure, different conditions trigger each creature, but they share a philosophy: come down for free after pilots churn through their decks with cheap loot effects, and quickly close out the game. Heavy-duty hosers prove underwhelming against this deck, as the only card they even hit is Arclight Phoenix. Players are better off attacking Phoenix with something like Surgical Extraction, which even still does nothing against two-thirds of the deck’s threats. In this way, Hollow Phoenix is a graveyard-utilizing aggro-combo deck that can withstand the hate, making it ideal for the Dredge-housing metagame. The many other Arclight decks are following suit. Speed: How little pilots must wait before the card comes online. Naturally, the number scale engenders some degree of bias, as I have no objective way of measuring a card’s power in a vacuum. But I believe breaking the list down into numbered ratings this way nonetheless injects some degree of impartiality into the ordering process. Rest in Peace is usually a game-ender against decks that live and die by the graveyard. Not only does it prevent opponents from developing their gameplan, it undoes all the work they’ve done so far! That “so far” is one of its problems, though—players get two whole turns to build a board before Rest resolves. On the draw, that makes the enchantment even less enticing against faster graveyard decks. Even more damning are Rest’s deckbuilding requirements. To utilize the enchantment, players must both be in white—one of Modern’s least proactive colors—and have little use for the graveyard themselves. Very few decks check both of these boxes, but those that do are having success online; BW Processor Eldrazi even appears to be making a comeback. Of course, UW Control is the default home for the card. UW is such a great fit for Rest that a build placed 2nd in the aforementioned Modern Challenge running no Snapcaster Mages in its 75… but 3 Rest in Peace main! The card’s slow speed and low splashability combine to make it a lackluster option for filling niche roles like dealing with Arclight Phoenix. There, it’s clunky and inefficient. Rest seems best at supporting the few strategies that can fit it, as it destroys graveyard-focused decks while significantly disrupting slower fair decks relying on Tarmogoyf, Bedlam Reveler, Tasigur, and the like. A one-sided Rest in Peace, Leyline of the Void is a go-to choice for many of the graveyard decks. These decks avoid spending mana disrupting opponents when possible, instead allocating their resources to developing a gameplan and stopping opponents from interacting with them. Leyline shuts down opposing plans from the start of the game for a 0-mana investment. Opening Leyline certainly trumps opening Rest in Peace, but drawing it later reveals its shortcomings. The card is a functional blank off the top of the deck, going from turn zero deployment to turn four. That’s no matter for Dredge, which hardly draws from the deck at all; it’s tougher for slow, interactive decks like (hypothetically) Grixis Control, which are bound to see the card a few times in each winning game. Leyline is therefore a favorite of faster decks, and incidentally of Faithless Looting decks—these can handily chew through naturally-drawn copies of the enchantment. The slower the deck, the harder it is to accommodate Leyline. Cage doesn’t exile all graveyards upon entering the battlefield, making it a good deal less powerful than Rest in Peace. But it still says “you can’t play graveyard Magic.” And for half the mana, at that. Cage’s mana cost may be its most alluring factor: just about any deck that isn’t dead-reliant on the graveyard can run it and feel confident they’ll have the mana required to deploy it. The artifact hits Dredge square on the head and while boasting applications against Arclight Phoenix, Snapcaster Mage, and the ever-popular Faithless Looting. It also stops Chord of Calling and Collected Company. Notably, it does nothing against Bedlam Reveler, Tarmogoyf, or delve creatures, making it a safe include in fair decks. Cage is more concerned with hosing opponents who cheat egregiously on mana, and only excludes those players from wielding it. While it’s a little more fragile than Rest in Peace, an enchantment, I don’t think this aspect of Grafdigger’s Cage subtracts much from the card’s viability. Graveyard decks usually run Nature’s Claim or Assassin’s Trophy these days to out everything from Rest to Leyline, so randomly dying to Abrade shouldn’t be a fear players have unless they’re playing many other cards that die to Abrade, such as Mantis Rider. And Ancient Grudge? Well, at least it no longer has flashback! Down from #1 in our old Modern Top 5 of Utility Cards, Surgical Extraction nevertheless returns here as an excellent answer to graveyard strategies. In Yu-Gi-Oh!, we call this sort of card a “hand trap:” it activates from the hand at no cost, and at instant speed. But since Surgical is so, well, surgical—it only hits one target, after all—its inherent surprise factor as a hand trap is rather limited. Instead, Surgical’s main purpose is its ability to remove key cards from opposing strategies. Against Dredge, those cards are Stinkweed Imp and Conflagrate; against Phoenix decks, the card is probably Arclight Phoenix. But depending on the game state, it could be Bedlam Reveler. This flexibility is a major draw to Surgical over other hate. The instant can play a myriad of roles depending on the matchup—hitting a destroyed Valakut, the Molten Pinnacle or a discarded Krark-Clan Ironworks can spell lights out for combo decks. It even has applications in fair matchups, countering persist triggers or Snapcaster flashback targets (cue endless debate about how over-boarded Surgical is). Ravenous Trap, too, scores perfect marks on speed and splashability: any deck can run it, and it’s never too early in a game for the card to fulfill its purpose. But while Surgical focuses down specific cards, Trap exiles an opponent’s entire graveyard. That nuance can be beneficial or detrimental, but in the current Modern, I’d say it’s generally a plus. Activating Trap before opponents reanimate Arclight Phoenix might not feel as good as activating Surgical, as we miss out on the “search” information and leave opponents with more copies in their deck. But opponents still have to get those copies into the graveyard. And how hard are those decks to read, anyway? If anything, I’d argue that the 2 life saved by Trap is often relevant in many graveyard matchups, which are by and large beatdown decks. The largest power boost Trap has over Surgical is its potential for blowouts. After opponents spend a few turns setting up their graveyard, dashing their plans with a well-timed Trap can simply end the game. Drop a Nihil Spellbomb and opponents will play around it; they statistically shouldn’t expect Trap, making it correct for them to play into it. Because of its high ceiling, Trap perfectly wields the surprise factor innate to hand traps. Overall, Trap is more narrow than Surgical, but more devastating. Since we’re not grading on flexibility today, Trap wins out. Even for an opinion piece, this one lays out a lot of claims. Is Dredge warping Modern to a fault? Is Ravenous Trap quietly one of the best sideboard cards in the format? Will Stinkweed Imp go the way of the Troll? Let’s keep the discussion going in the comments! As soon as creeping chill started showing up in dredge I found my ravenous traps. It was the best option with GGT. It is arguably the best option now, especially in other fast decks. If I’m on humans, burn, infect etc, I don’t need the dredge player to be locked out of the game for good. I just need them to lose a turn or two. Even if the trap only takes away a bloodghast and a couple of dredgers, that can be a massive swing of momentum. For most Modern decks that are struggling with the Dredge matchup, I agree that Trap is probably the best option out there! hey, great article. i’d like to add a bit of nuance to Surgical Extraction vs. Dredge. 1) if you run Surgical Extraction vs. Dredge in slow decks like mine, its better to go after the payoff cards. dredge has no problem getting multiple dredgers in the yard (there are of course exceptions). Going after Narcomoeba/Bloodghast has proven best for me, because there is a significant chance of permanently shutting off Amalgam, especially with Snap-Surgical. if you get the board under control (for me with Anger of the Gods, Izzet Staticaster or Young Pyromancer), it still has proven better for me to go after Conflagrate and even Creeping Chill before the dredgers. going after them is only viable if we have a fast clock to take away their time to rebuild. the overarching idea is that dredge is actually somewhat threat-light and just runs out, no matter how many cards it sees. 2) i actually think Surgical is UNDERboarded. Surgical Extraction gets exponentially better the more you have. 1 copy can give you a chance to establish your own clock vs dredge, but having 2 (or surgical-snap) is just game-winning. 2 surgicals are much more than 2x as good as one. which is why i’ve been up to 3 copies in the board since creeping chill. this incidentally significantly improves KCI, makes storm almost easy, and in tango with Fulminator Mage/Field of Ruin is great against Tron and Valakut. i will say that Surgical Extraction is probably the best it can possibly be in Grixis control. the applications are endless. Nice insights. I actually agree with you that Surgical is under-appreciated/under-boarded in Modern, and side it in almost every deck I play (they all happen to be relatively fair creature decks). But I think we’re in the minority there! Good luck on Grixis, I’d like to see that deck perform in this metagame. I think when people refer to Surgical being overboarded, they’re usually talking about how people always seem to bring it in vs. grindy matchups where the card disadvantage hurts quite a bit, and where the impact is not actually all that high (e.g. bringing it in against Snapcaster Mage decks.) I also often see people make the mistake of thinking Surgical will when the game when it actually doesn’t, and then durdling around and ending up dying. There aren’t many decks, even combo decks, that are so fragile that a single Surgical will actually win the game, so I think that’s important to keep in mind. That said, it’s a fantastic sideboard card. Just know its limitations and avoid these common pitfalls! i’ve been labouring over grixis control with a friend for months. And we developed an interesting theory how to increase the overall winrate of the deck: Go for as many close matchups as possible. having an 80% winrate against one deck meant we were loosing potential in another matchup. basically, if we win 70% of matches by the edge of our teeth, its still a massive improvement to winning 60% of all matches more comfortably. And Surgical Extraction fits perfectly into that theory. To give an opinion on your question: Is Dredge warping Modern to a fault? I don’t think so – let me explain: If we take a look at the most successful decks in Modern right now we have a lot of decks that rely on the graveyard – different “Flavors” of Dredge in Hollow One, Phoenix, BridgeVine, the real Dredge that differ in how disruptive, explosive and consistent they are, but also Combo like Storm, KCI and Scales Affinity (relies on “dies trigger”), but also a lot of the fairer decks rely on the graveyard for parts of their strategy – Mardu Pyromancer rather heavily, to smaller extends Grixis Shadow (Delve-Threats, Snapcaster) and BGx (Tarmogoyf, Kolaghan’s Command, Lingering Souls). There’s some with less reliance like UW control and a lot of decks outside the tiered ones (Grishoalbrand or Living End) which also rely on the resource Graveyard. My theory is, while dredge is the deck that got people to gear up on Leylines, Rest in Peace and Surgicals, i wouldn’t hold dredge alone accountable for the current trend of maindecking those cards – its just that people started to notice that they actually hit a lot of decks really hard. A few years ago – back under twins reign – the maindeck 1-of relic of progenitus to hold Tarmogoyfs, Living End and Grixis Control down was – if my mind doesn’t play tricks on me – a common thing for a lots of decks to have in the maindeck and vanished since then. I still know that Grixis Control was considered the worse Jund at the time (although it was good at out-junding Jund) because of the heavy reliance on the graveyard which was often addressed in the maindeck by other decks. Imagine my surprise when Mardu Pyromancer took off – that was only possible due to graveyard hate nearly completely vanishing from the format. I suppose that at the moment we just are at a tipping point were the things the resource graveyard offers through differenct cards (value, resilience, inevitability, explosiveness) have come to a critical mass where many decks can lean on different things the graveyard provides and for the first time in modern history half of the tiered decks actually use it. And this is a point every non-rotating format will reach through time. Take a look at legacy – it’s not uncommon for Merfolk to play Leyline of the Void or for Elves to have Surgicals in their sideboard – basically every deck has some amount of them – the blue based decks with cantrips usually 3, 2 if they feel they can rely on herd immunity – and the non-blue somewhere between 3-4 and Grafdigger’s Cage in addition to be able to reliably interact in the first few turns. And still in this format there are different flavors of heavily graveyard reliant decks – Comboesque Reanimator, Dredge, Aggro Loam and some that utilize it for other means like Storm. Since cards enter the format at a rather slow pace, it has needed some time to come true for modern – but in my opinion being able to meaningful interact with the graveyard early will always be the necessity for a format that grows old. Dredge was certainly the reason people started loading up on graveyard hate, but i don’t think that dredge is so oppressive (especially in a world of Settle the Wreckage, Anger of the Gods and Terminus where catching up is quite possible and dredge itself is so bad at interacting with other decks that it is easily raceable by the likes of Storm or Infect) that it necessitates Maindeck hate – it’s just that people started noticing how often those cards are really good and you would bring them in a lot of the time to the point that they are worth maindecking.